15 minutes a day to transform your writing—and your life. What if I told you that fifteen minutes a day could radically change your writing, your day and your life? This program is designed for writers and non-writers alike, to help you jumpstart your writing, reconnect with your center, and access your deep creativity. *Be supported in your writing practice? *Be supported in a meditation practice? *Listen better — to yourself and others? *Feel more fulfilled, communicative and productive? This simple, radical program is designed to have all of these effects..
I’ve been amazed at how much progress I can make with my writing in just fifteen minutes. The meditation sets me up to do some of my best work. Rather than sitting at my desk trying to figure out what to do, I find I have great focus and can get right to work following Nadia’s meditations and prompts. I never had a daily writing practice before trying Nadia’s challenge, and it revitalized my writing. It was so much easier–and more fun–than I thought it would be!. Each day, you’ll have a new 15 minute recording. It sounds simple, but it’s radical! “Thank you, Nadia–I so enjoyed these writing sessions. They were like fifteen minutes of magic”–Trisha W.
Why bring meditation and writing together? When we meditate before we write, we clear our mind of the chatter that so often takes up our inner space. We quiet our nervous systems, reconnect with our bodies and learn to listen more deeply to our own inner voices. After just a few minutes of meditation, our writing can be much more focused, insightful and powerful. At this busy time of year, we might feel like we have no extra time at all. That’s why a course like this is all the more important! However busy we are, it’s essential that we take time for ourselves. In my personal experience, and in my professional experience working with hundreds of students, fifteen minutes a day is the perfect amount of time to establish a new habit and relationship with yourself. Instead of cutting into your too-busy day, fifteen minutes of meditation and writing will make your days feel fuller, more spacious, more efficient and more rewarding. And I promise that you can fit in the extra fifteen minutes without losing out on anything important. In fact, spending fifteen minutes a day on this practice will make you feel like you have MORE time! I recommend trying to use the audio recordings as a daily practice for at least for a month, and the course and facebook group gives you lots of support to do this. But if you can’t start right away, don’t worry! Once you enroll in the course, you have lifetime access! This course comes with resources to turn the practice into a full year long program, so you can use the recordings once or twice or three times a week for several months and then still return to them later and turn them into a month-long (or two- or three- or four or twelve-month) daily meditation practice. Hi! I’m Nadia! I created this course because I know first hand the power of both mediating and writing, and that power compounds when we put the two together! I’ve been a reader and a writer for as long as I can remember, and I have also benefited enormously from mindful practices over the past fifteen years. I found that while writing was my first love, meditation helped me heal and grow in ways that writing alone could not. Though I have a PhD in English from Columbia University, and my own creative writing has been widely published in such places as The New Yorker, The Boston Globe Magazine, Spirituality & Health and The Kenyon Review, I didn’t want to follow a more traditional teaching path, because I wanted to find a form of teaching that taught the whole person and that took into account the growth that one does throughout one’s life. 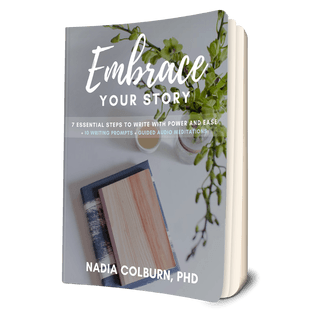 I created Align Your Story to teach in this more holistic way because I believe the result is not only do we get stronger as people, but our writing also gets stronger. We come to produce our best work when we come from a more centered, grounded place. Only when we can access our own fullness of being can we create our fullest, best work. Lifelong enrollment. Start any time. Come back to the course any time! ​ with new prompts for each month so the program becomes a FULL YEAR of daily meditations and writing prompts! And once you have a year long practice, it’s easy to make it a LIFELONG PRACTICE! +Expansions to turn the 15 minute practice into longer supported, mindful writing sessions. ​and share it with friends! Note: if you encounter any technical difficulties signing up, please reach out to me and we will work around them! Think of the fifteen minutes as both a radical detox and a revitalizing reset. Most of us are ready to revitalize, but we forget the detox step. We’re ready to jump into our writing and go full force ahead. I get it. I do that, too. Even though I know the benefits of meditating before writing, I’m often so eager to get to work, that I go right to my computer. I feel that I’m too full of ideas to quiet my mind and sit in mediation first. So if I feel this way, I understand if you do, too! But when I DO meditate before I write, my writing is more clear, more direct, more focused, more profound, more creative, more surprising, more insightful. “I can’t believe how much I can write in only ten minutes when I meditate first.” -Janice P.
“Most of the time by minute ten, I’m still fidgeting in my seat before I write, but when I meditate first, I often do my very best work in the first few minutes of writing.” -Paul F.
But it’s hard to do this alone. That’s why I created fifteen minute audio guides. All you need to do is hit play and you’ll be guided in the meditation, be given a writing prompt, and be given ten minutes of supported writing time. If you want to keep writing after that, please do. But if you don’t, no worries. You’ve done your fifteen-minute practice for the day! Research shows that just a daily three minute meditation can re-set your nervous system, reset your immune system and transform your life! We live on overload most of the time. We rush from morning to night, and when we have down time, we often use it to scroll our newsfeeds or to consume some other form of media. Even when we’re not working, we’re often infiltrated by the news and the energies around us. Most of the media we consume is inherently stressful. Even our “entertainment” often includes edge-of-the-seat action to keep us emotionally engaged. No wonder our systems are overloaded. And as our mental and emotional systems get overloaded, our physical systems, too, get overworked. Our adrenals, our kidneys, our livers, our central nervous system, are all working overtime. Stress leads to inflammation and a general weakening of the immune system. We become emotionally and mentally imbalanced. We can hardly hear our own thoughts and our own voice for all the noise around us. My meditation and writing practices start with meditation to help you disconnect from all that external noise and calm your mind and your body. Imagine if you never took a shower, you’d be pretty covered in grime and filth and would start to smell and would very likely get sick. Our culture spends a lot of time thinking about our external cleanliness and appearance, but very little time focusing on our internal health and needs. And we tend to separate the mind and the body, as if they were two separate things, but as new research shows, they are inextricably connected. Every day, you’ll have a new guided audio meditation to practice with. Whether you are completely new to meditation or an experienced meditator, this program will give you empowering meditations so that you never need to miss a daily meditation. You get to experience lots of new meditations and see which work best for you. So many people struggle with finding time in their day for a daily meditation. This program makes it as easy as sitting down and hitting play! And even if you already have a daily meditation, this program can be a nice complement to any daily meditation practice. Meditation helps us quiet our mind. Coming into quiet is important. And we also need to express ourselves. This program guides you to listen to yourself and tap into your authentic voice and deep creative power. And it guides you to write not just from your over-busy head, but from your centered body that you have connected with in the meditation. Each day I’ll offer a different prompt to help guide your writing. These prompts are designed to stand on their own and jumpstart new writing AND to help you go to new and deeper places with writing projects you’re already working on. Ten minutes of writing after a short meditation can produce more powerful and insightful work than hours of writing in other conditions. You write not only from your wandering mind, but from the insights and wisdom of your body. And during the ten minute writing time, I’ll offer short reminders to stay connected to your body as you write. Most of us tend not to write at all or to sit down and write in little bursts. This program guides you to develop a daily writing practice so that you have a regular, comfortable and intimate working relationship with your writing and your voice. It helps you get through blocks and stay unblocked. And just as meditation has powerful health benefits, writing has been scientifically shown to improve both emotional and physical well-being. Expression and self-understanding are some of the key factors in health and help regulate both our moods and our immune systems. “I used to write only from my head. Working with Nadia, I learned to write from my belly. Sure, my head is still working, but what I’m saying is so much deeper and more honest now.” –Raina A. What If I can’t commit to a daily practice, is this course for me? Yes! While I recommend a daily practice, I understand that can be hard. Do what makes sense for your schedule. Try for three times a week. Or two. Be intentional about it and try to keep up with your own intentions. Use the facebook group for support. There’s no falling behind in this course and no failing! The supporting materials will help you decide what is right for you. Perhaps over time, you’ll be ready to try a daily practice (it’s quite powerful!). But you don’t need to to benefit a great deal from the course. I’ve never meditated before, is this course for me? Absolutely! This course will walk you through meditation and you can always come to the facebook group for support.. I haven’t written in a long time, is this course for me? You bet! This course will get you writing again! I already have a daily mediation practice, is this course for me? This course only offers short meditations, so stick with your daily practice and add this to it. If you have a daily meditation practice, I think you’ll enjoy bringing writing to another meditation practice! I already have a daily writing practice, is this course for me? When you bring meditation and writing together it can really boost your daily writing practice and help you have deeper insights and access a different level of creativity! So yes! I’m in the middle of a long writing project, is this course for me? Yes! It can be hard to stick with a long writing practice. There are special directions for how to use this course in tandem with a longer writing project. This course will get you working more efficiently and help you clarify your message and your writing and strengthen your own unique writing voice.